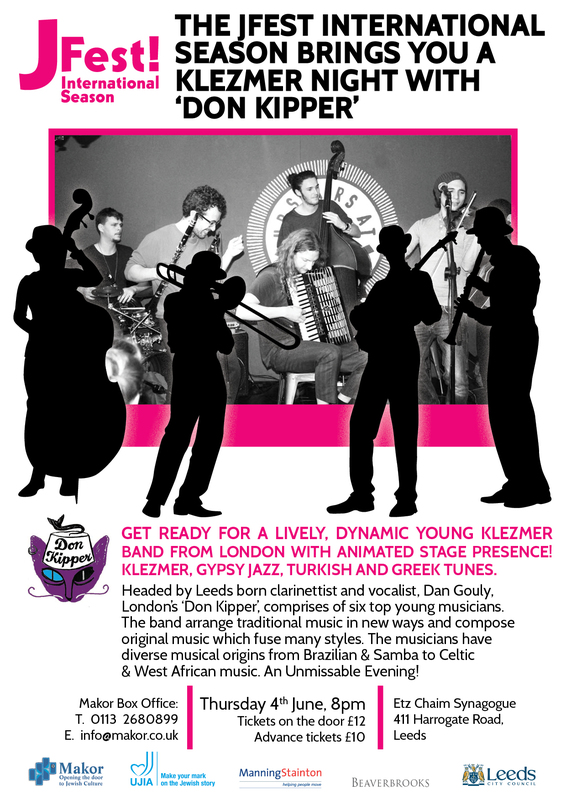 Award Winning Young Klezmer Band hit Leeds, Thurs 4th June as part of JFest International Season! Get your tickets now for a night of award winning live Jewish music! Part of the JFest International Season, ‘Don Kipper’, London, hit Leeds on Thursday 4th June for one night of Klezmer, Gypsy Jazz, Turkish and Greek music. Headed by Daniel Gouly, originally hailing from Leeds, these guys are young, energetic and above all, first -rate musicians! Don Kipper is a London-based ensemble dedicated to interpreting music of Eastern origin. Their repertoire includes Klezmer and Gypsy Jazz but ranges to Turkish Fasil music and Greek Rembetika. Whilst respecting the ancient origins of these forms Don Kipper love to arrange the music in new ways and also compose original music which fuse many styles and combine elements from a variety of backgrounds. The musicians in Don Kipper themselves have diverse musical origins stretching beyond the scope of the band’s repertoire – such as Brazilian Samba, Celtic and West African music. Get Kipperised! 8pm, Etz Chaim Synagogue. £10 in advance, £12 on the door. Call Makor on: 0113 2680899/email: info@makor.co.uk.